Maximizer, a leading provider of customer relationship management (CRM) solutions, is excited to announce that the Maximizer Connect application is now available in the Zapier® App Marketplace. The latest integration for Maximizer Connect – Zapier – is a popular interface that allows web applications to work together automatically, quickly and easily. We’ve got more tricks up our sleeve, but to kick off our Zap Attack, the Maximizer internal team has been using and testing many of the most popular tools and are already benefitting greatly from the Zaps they’ve created to automate business tasks in the way the team needs. These powerful Zaps automate repetitive and mundane tasks with workflows – ultimately making business processes run more efficiently. Maximizer Connect now easily integrates with many applications that people may already be using and didn’t even know they could zap to Maximizer CRM. Without any programming or development costs it is easy to automatically record notes in Maximizer from Gmail or Slack, create follow-up tasks from Toggl when time thresholds are exceeded, or create contacts by taking a picture of a business card with FullContact. 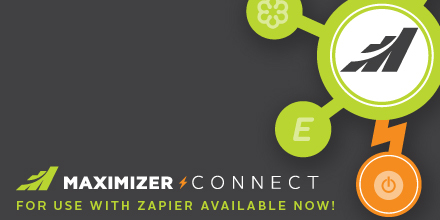 Maximizer Connect for Zapier saves time allowing small business owners to concentrate on their businesses – making everyone Zappy. Visit: http://www.maximizer.com/zapier to get zapping with the Maximizer Connect application. Since 1987, Maximizer has delivered Customer Relationship Management (CRM) software and professional services meeting the needs, budgets and access requirements of small to medium businesses. Simple, configurable and affordable, Maximizer CRM enables organizations in all industries and markets to increase sales, enhance marketing, and improve customer service while boosting productivity and revenues. Headquartered in Vancouver, Canada, with worldwide offices and business partners, Maximizer Services Inc. has sold over one million licenses to more than 120,000 customers. For more information, please visit: http://www.maximizer.com.